The Holiday Inn Express & Suites Akron South offers an ideal location just minutes away from the Akron-Canton Regional airport, prominent businesses and local attractions such as the Pro Football Hall of Fame, The University of Akron, Goodyear, Timken, and GOJO. If you are traveling for business or leisure, the hotel staff will make sure this is your home away from home. 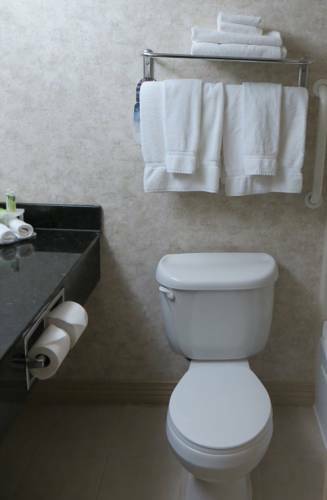 Each room features a microwave, fridge, and coffee maker for your convenience. We offer a complimentary airport shuttle between the hours of 5am to 11pm. Start each morning with our healthy start complimentary breakfast. Work out in our Fitness Center, relax in our heated indoor swimming pool or out on our outdoor patio. Here on business? We offer complimentary high-speed Internet to all of our guests and our Business Center is open 24 hours for all of your business needs. Having a meeting? The Holiday Inn Express & Suites offers 2300 sq. feet of meeting space available to accommodate all of your meeting needs. We also offer a 24-hour guest laundry room and same day dry cleaning Monday through Friday. We hope to welcome you soon! TGI Fridays: Full Service American Restaurant located minutes from our hotel. Chenoweth Golf CourseChenoweth Golf Course offers a great golfing experience on our challenging 18 Hole Golf Course. While not only one of the more popular Golf Courses in Akron, Ohio, Chenoweth is the perfect place for your next wedding reception, banquet or special event. Firestone Country ClubThe 18-hole "South" course at the Firestone Country Club facility in Akron, Ohio features 7,139 yards of golf from the longest tees for a par of 70 . The course rating is 75.1 and it has a slope rating of 128 on Bent grass. BRIDGESTONE-Firestone WORLD GOLF CHAMPIONational PGA Golf Tour Course. Blossom Music CenterSummer Music Concert Outdoor Arena. Canal Park-Akron Aeros BaseballHome of the AA Eastern League.